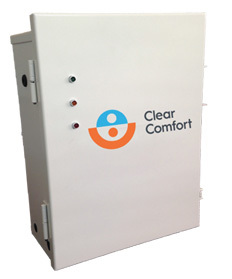 Experience the difference with Clear Comfort’s LifeGuard Technology™, the only two-stage pool treatment solution that destroys contaminants on contact and residually without the need for toxic chemicals. Clear Comfort is guaranteed to awaken all five of your senses. There is no need for measurement, dosing and handling of toxic chemicals. The system is designed to self-balance and self-regulate, creating a hassle-free, clean and clear pool. The hydroxyls produced by the system are potent and fast acting. The hydroxyls degrade organisms and other unwanted compounds before returning to the pool environment. Low levels of hydrogen peroxide are distributed throughout the pool for a second, continuous level of protection. Peace of mind for you and your family without the dangers and irritation of traditional chemicals. You’ll notice the difference in the feel of the water with Clear Comfort.